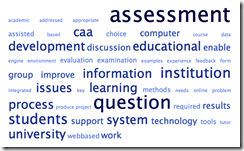 I had great fun at the recent CAA (Computer Assisted Assessment) Conference hosted by University of Southampton, UK. I’d like to thank the team there for taking the lead in organizing the event and opening a new chapter in its history. This conference builds on the success of the 12 previous CAA conferences hosted at Loughborough University. Although I didn’t go to the first event in 1997, I’ve been a regular attendee on and off for the past 10 years. 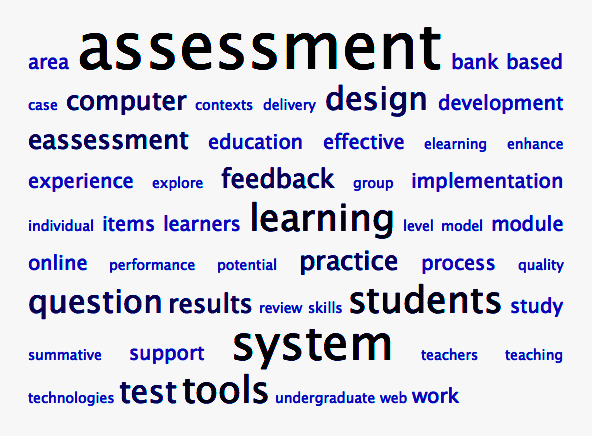 Assessment obviously remains a key focus of this community, but I was also struck by the very technical language used: system, tools, design, computer and so on. However, it was also interesting to see which words were missing. Traditionally I would have expected words like reliability and validity to feature strongly. 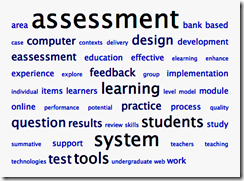 Although summative assessment makes an appearance formative assessment does not feature strongly enough to appear in the cloud. Clearly students, learners and the individual are important but where is adaptivity or personalization? It is interesting to compare this picture with a similar one taken from the abstracts of the papers in 2000, ten years ago. An important part of our mission at Questionmark is learning from communities like this one and using the knowledge and best practices to develop our software and services. During the conference I witnessed a range of presentations covering ideas that we can apply right now through to some fascinating areas of research that point the way to future possibilities. The conference was a great success, and planning for next year (5th-6th July 2011) has already started. 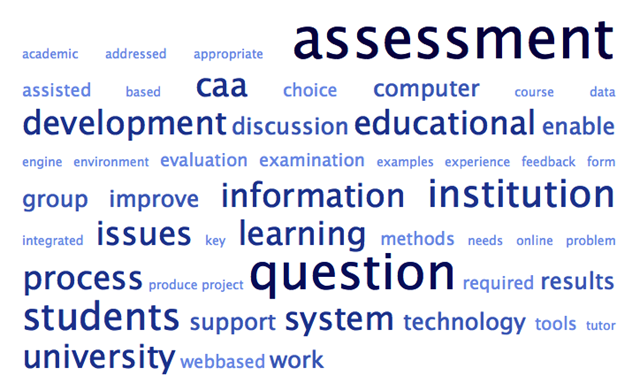 Check out the CAA Web site for the latest information.